This extreme lightweight platform pedal is made from magnesium and with pedal spindles in titanium - the weight is an impressive 155 grams per pair. There are only one platform pedal on the marked that are lighter then this one, but at a much higher price, and our new pedals look better on a Brompton we think. This pedal will save you 260 grams over the original Brompton folding pedal, but since it's not a folding pedal it will give a slightly larger package when the bike is folded. 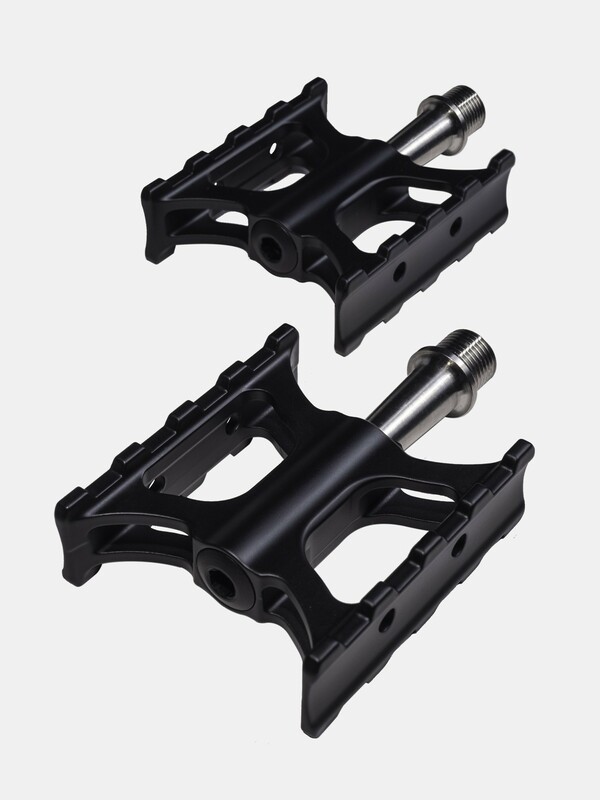 The pedal body is extruded and CNC machined in magnesium, and then powder coated black. At 75 mm long by 65 mm wide, the pedal is inherently light weight, but the platform is still large enough to provide a stable grip for your foot.